Space is at a premium in New York City. Architects have the challenge of making small spaces functional, livable and beautiful. Photographers, in turn, have the challenge of making these small spaces read well in photographs. Photographing a renovated Manhattan condominium for architect Laurence Tamaccio of Design Destinations, challenged me to capture relatively small spaces and have them appear spacious and inviting. The view from the dining room to the kitchen takes advantage of natural light spilling in from the windows. The panoramic view of the living room and dining room features well placed floral arrangements and other props to keep your eye moving through the image. 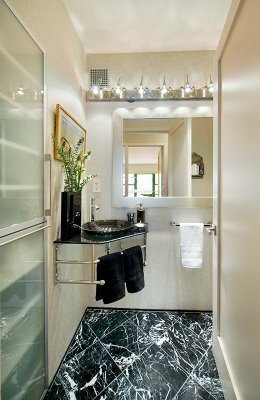 To show a small powder room, I used a very wide lens, a 14mm lens. Any lens wider than this would be a fisheye lens, which is great for photographing skateboarding, but not for architecture. Hiding lights in small spaces is difficult, so the existing ambient lights were used and post-production Photoshop work helps reclaim detail in the darkest and lightest parts of the image.